Because of the nature of the Mediterranean Sea, tides are almost imperceptible there. The first Greek known to describe them was Pytheas, a late fourth century BC navigator, astronomer, and mathematician, who got through the straits of Gibralter (which were usually controlled by the Carthaginians) and sailed up the North Sea. Contemporaries dismissed many of his observations. 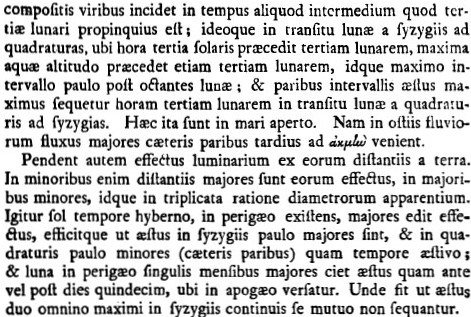 Connections of the tides with the moon were known, but an explanation for the cause of tides was still lacking in Newton’s time, and this physical explanation was one of his major contributions (though details remained to be worked out). sol-aribus: the solar day varies, with an average of 23 hours, 56 minutes. 2 patet: (from Liber I, prop. 66, corollaries 19 and 20). *minori: less; modifies spatio (for the -ī ablative of comparative adjective, cf. Harvey). 8-9 incidit: Long or short “i” on -cid? 12 infra horizontem: i.e. away from on the opposite side of the earth. 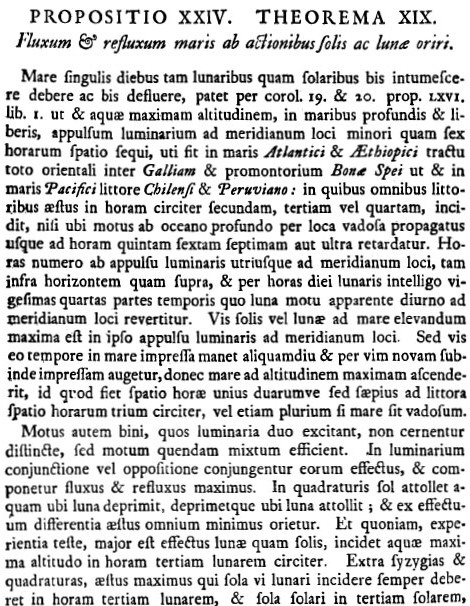 quadratura: the sun and moon at right angles to each other (quadrature); at this time the tide is lowest (“neap tide”). 18 ceteris paribus: ablative absolute [still used in English today].